Available in Spider version 2013.11.14 and above. PCSchool has added the ability to make the absence status drop down list in Absence Entry ‘Read Only’ or ‘Hidden’. 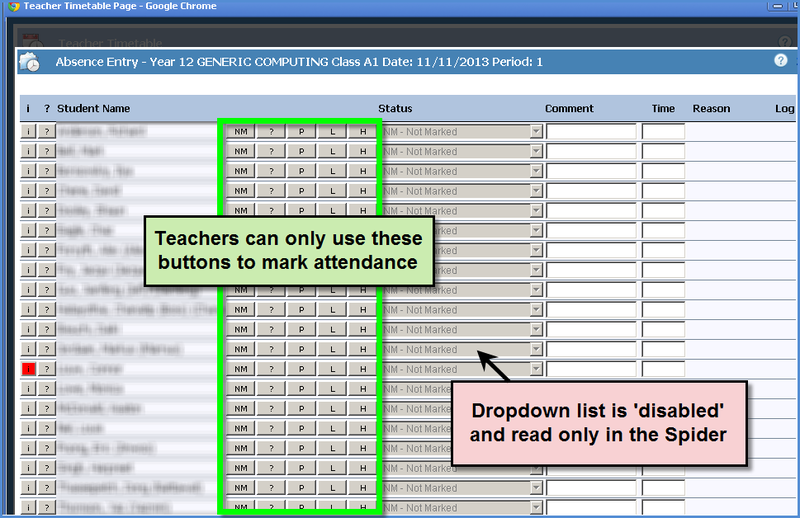 This option can be used by schools who want teachers to be restricted to selecting from four status buttons when marking the attendance roll ( for example Not Marked, Unexplained, Present, Late for Class and one other), while the teachers can still see the other statuses entered in by the Back Office staff / Attendance Officer it will be in ‘Read Only’ mode. 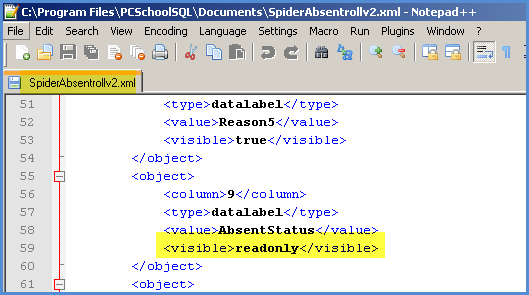 The ‘spiderabsentrollv2.xml’ file found in the PCSchool\Documents folder on the server must be modified accordingly: Click here for information on how to customise the Absent Entry status buttons. This entry was posted in Attendance, Behaviour & Attendance, Configuration, Spider and tagged Attendance, Classroom Management, pcschool, Roll Marking, school administration software, School Administration System, School Management Software, School Management System, school software, Spider Attendance, Student Information System, student management Software, Student Management System, web spider by studentmanagementsoftware. Bookmark the permalink.